Netflix to complete international expansion "over the next two years" | What Hi-Fi? Netflix to complete international expansion "over the next two years"
Netflix has told its shareholders that it believes it can complete its worldwide expansion "over the next two years", with the video streaming service already in operation in around 50 countries. The service is confident of taking that figure to 200 countries thanks to the "tremendous growth of the internet in general", which includes the ability to get online from smart and mobile devices. It comes as Netflix published its financial results for the fourth quarter of 2014 – a period in which 4.33 million members were added worldwide, taking the total number to 57.4 million members. Netflix reported Q4 2014 revenues of $1.31bn – up 36 per cent year-on-year and 6.7 per cent on the preceding three months. It's anticipated Q1 2015 revenues will grow further to nearly $1.5bn. The US market remained the driving force behind Netflix's strong performance, with $917m of its revenue coming Stateside. International revenues, however, were up 76 per cent year-on-year. 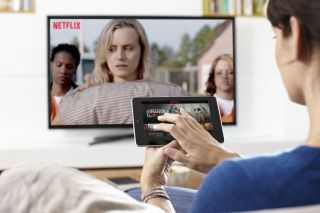 And that "rest of the world" performance is set to be boosted further with the launch of Netflix both in Australia and New Zealand towards the end of the first quarter of 2015. Further "major countries" are expected to follow in the coming months as Netflix continues to new markets and continues to "expand as fast as we can while staying profitable on a global basis". In its letter to shareholders, Netflix said: "Acceleration to 200 countries is largely made possible by the tremendous growth of the Internet in general, including on phones, tablets and smart TVs. "We intend to stick to our core ad-free subscription model. As with our initial round of international expansion, we’ll get some things wrong and do our best to fix them quickly."